I am participating in a book tour for the new Imagination Station series of books. We have been reading these books aloud for the past several weeks and have thoroughly enjoyed them. I want to tell you all about them today. If your child has enjoyed The Magic Treehouse Series, they will most certainly like Imagination Station, published by Focus on The Family/Tyndale House. 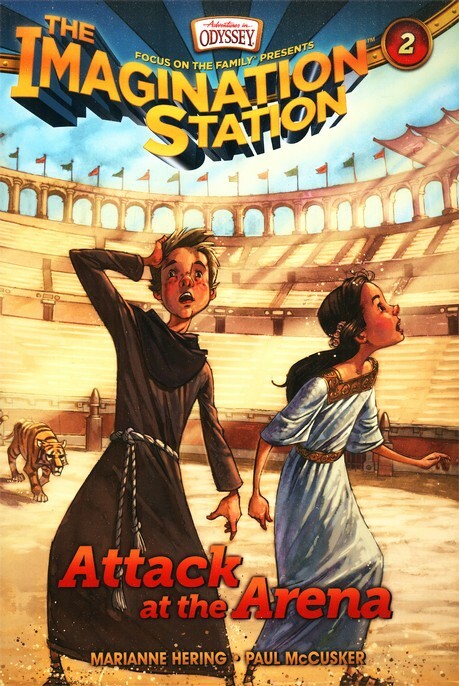 If you're a fan of Adventures in Odyssey, you will love this extension of the popular audio series. The books are the adventures of cousins Beth and Patrick, who (while visiting Whit's End) find the Imagination Station. Each story is based on what Beth and Patrick would do because of their faith in God. The books teach about history THROUGH A LENS OF FAITH. Currently there are 6 books available, with more coming soon. In our history studies this year we have been learning about the Ancients and have just started Medieval times... The first two books (Voyage with the Vikings and Attack at the Arena) were of particular interest to us. I read them aloud to my six year old. They are recommended for ages 7 and up, but I think children as young as 4 or 5 can listen to them. Composed of 15 short chapters, the books can be read in little chunks here and there, although my son was begging me to read several chapters at a time! My son is able to read them by himself, but I wanted to hear them, too! My daughter, 10, also enjoys the books and has been reading them on her own... these are books that can be passed down to several children, or enjoyed with multiple ages at the same time. I love those kinds of resources! Each book follows the same sequence of events -- Beth and Patrick start out in Whit's End in the Imagination Station and are given a different challenge. 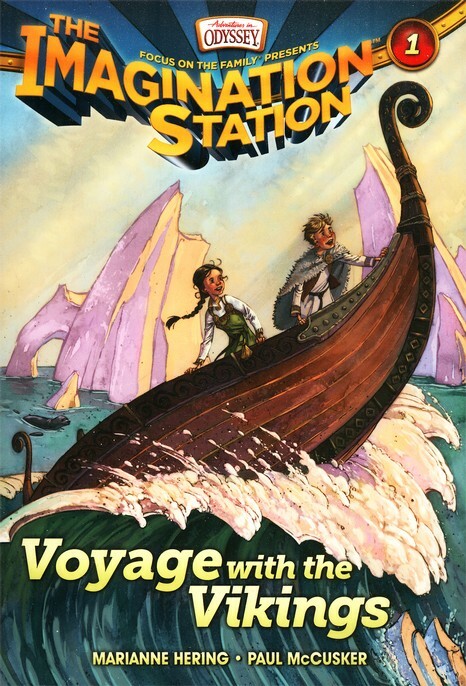 The Imagination Station takes them to the particular period in history and Beth and Patrick must face adventures and challenges to solve the mystery. The historical information presented is accurate and memorable. These books are a wonderful supplement to our history curriculum! At the end of each book there are a few little written puzzles to complete to come up with a secret word. Once your child has this word, they can then go to the Imagination Station website and enter this word to unlock a free Adventures in Odyssey episode. My son loved this! You can also see previews of each book and much more! If you'd like a chance to win a set of the books, you can visit my friend Kathy's blog, where she is hosting a giveaway. Disclaimer: I received the above named products from Tyndale House Publishing in return for my honest review. I have not been compensated in any other form.